We keep talking about the importance of stretching for riders, and about suppleness being the foundation of our position. And I know you agree, but what I hear from you is that sometimes you find it hard to fit it into your day. This got me thinking about Stephen Covey’s Big Rock analogy. In case you haven’t heard it, I’ll start by sharing it. A time management guru was speaking to a group of type A personalities. He placed a wide-mouth gallon jar on the table in front of him. 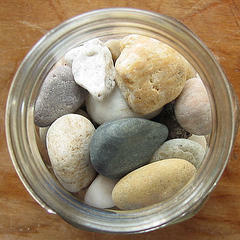 Next to the jar was a collection of fist-sized rocks. He carefully filled the jar with the big rocks, until he could fit no more. “Probably not,” was the group’s reply. With that in mind, I thought I’d share this stretch I do whenever I am filling water buckets. It is good for loosening the chest, shoulders, and upper back muscles, and lengthening the back line. And it’s nice to do in the barn because the stall wall is a good height for it. First, I wedge the hose into the water bucket I am filling, and then I grab the bars above the stall wall, folding forward from the waist and keeping my knees soft (with just a tiny bend). Think of lengthening the whole spine in both directions at once, as you gently let your chest drop down, down, down, through the gate of the shoulders. Don’t force anything, keep your breathing deep and regular, and stay in the stretch (with one ear on how the water bucket is doing so you don’t overflow). Once the bucket is full, come out of the stretch and move on to do the same in the next stall. As an Exercise Physiologist, I love this analogy. I am constantly hearing from people that they “don’t have time” to exercise, and I’ll be using this story. I also tell them exercise should become like brushing your teeth; a must that you wouldn’t skip for a day; a little bit & working it into your day is always better than none. I recommend people do crunches, stretches, or get up and jog in place during TV commercials if they must watch TV. Thank you, Lori, keep em’ comin’, I look fwd to your writings! I love this whole article on finding time to stretch. You have really enlightened me about the spare moments I have waiting for simple things like water buckets to fill! Thanks! Nice one, I will definitelty give this a try! I am a tall person and my kitchen counter tops (and sink) are about two inches too low for me. Too costly to have the entire kitchen “fixed”, so I do these stretches when I am washing dishes or cooking, baking, etc. I now leave the kitchen without a sore lower back. Thank you for taking the time every week to publish your blog, I enjoy every one of them! I loved the time analogy; I have one student that always complains about not having enough time. I will send this to her. I ride, stretch, and do my core exercises regularly, but can’t find the time to squeeze in tai chi/chi gung, though I know it is excellent for movement patterns and balance. I water my garden every day by hand. Now I can just set the hose down, do some chi gung, then when that area is flooded, move to the next area of the garden & start the next chi gung. As usual thanks, everything you send is very inspiring.